Random Thoughts by Rebecca: Root Canal Series: Part 2 - What is trust? Root Canal Series: Part 2 - What is trust? Another interesting lesson of my root canal. As I was sent from my dentist to the endodontist I realized on the drive over that I knew absolutely nothing about these people. I was in excruciating pain and only wanted relief but couldn't help wondering if this endodontist had been on the news for some heinous root canal crime. I was cursing my decision to stop watching the news several years ago. After all, there's never anything good on the news. Which is exactly the problem! Was this endodontist shown on the news with her white coat over her head being escorted to a police car with angry toothache patrons holding picket signs? I had no idea. I was in way too much pain to do a thorough iPhone Google search. It started out ok. The lobby was normal, the front desk lady was polite. Then....then..... then..... I went to the room of doom. The one with the "recliner". There I found a lady that wasn't new to the world of removing infected pulp, but she was new to this office. She and the veteran pulp sucking assistant spent much of my diagnosis bickering about the right x-ray techniques, why do we use this, why don't you have that, don't put that there. Meanwhile, back in the recliner, I've been poked in the eye, had the roof of my mouth scraped with a metal torture device and my lip pulled and smashed. The whole time, no one was really talking to me. They talked about me, around me, above me. The tooth band thingy kept popping off and three different people tried three different techniques and finally when it was time to begin, I freaked out. The actual endodontist came in all cheery and ready to put a power drill in my mouth and I said through green plastic shields and metal tooth bands, "get this off now". Which sounds like, "Ge is oh nohw'. At first she was unsure and then she finally looked me in the eye and it was clear I wasn't kidding. My kids know that look very well. Once she had removed all the gear, she sat me up like a normal person and sent "frick and frack" out of the room. With tears streaming down my face I said, "I have lost all confidence that you and this team have the ability to do this procedure." She finally talked to me, and with me. She told me about the procedure, what to expect, and she cared about how I felt for the first time since I got there. Trust. It's that soft and squishy thing that's hard to explain. We just know when we do or don't have it. In my work as a consultant, I know that trust takes two things, character and competence. Basically, you have to care and you have to know how. Neither of these were immediately presented to me in that office that day. Think about your relationships. How much do you care? Not the fake kind of care. The kind that has you doing things differently only because you know it's important to the other person. The kind of caring that comes from a strong character. A big part of your character comes from your intent. What is your intent? Is it to get the other person to do what you want them to do, or to truly know that person? To jump to the punch line, my endodontrist gave me movie tickets and a big apology when I left. She divided my appointments up because my mouth couldn't take the full deal with all of the challenges they put me through and to date, I think I'm gonna live. She showed me good character and she finally had the competence to remove my infected pulp. That's good stuff. Trust is a big deal. Try to understand it more. 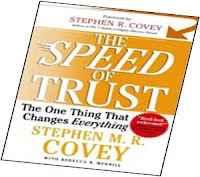 Here is my shameless plug for a book that can help you with this: The Speed of Trust: The one thing that changes everything.